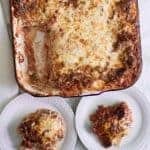 Classic lasagna recipe made with traditional ingredients like sausage, homemade sauce, and loads of cheese. Plus it’s freezer friendly too. 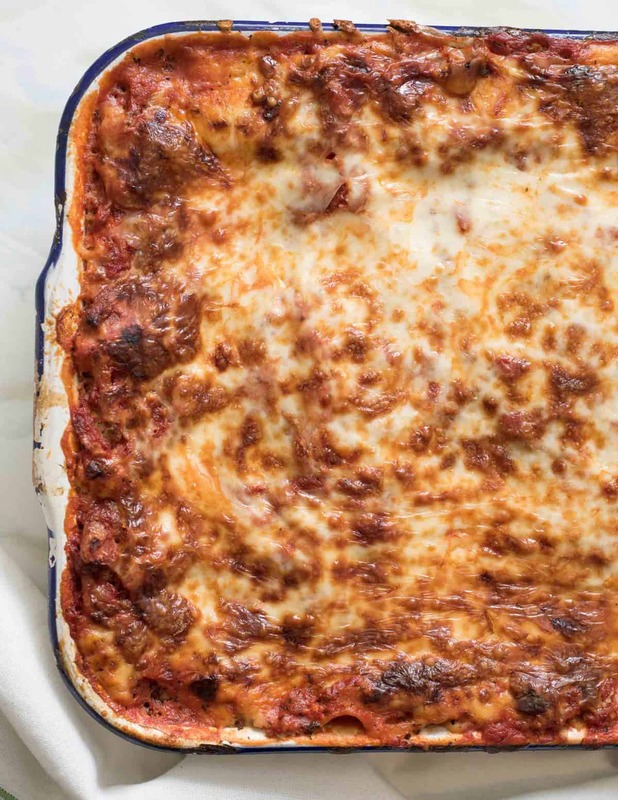 Few things are more comforting than sitting down to a pan of homemade lasagna. 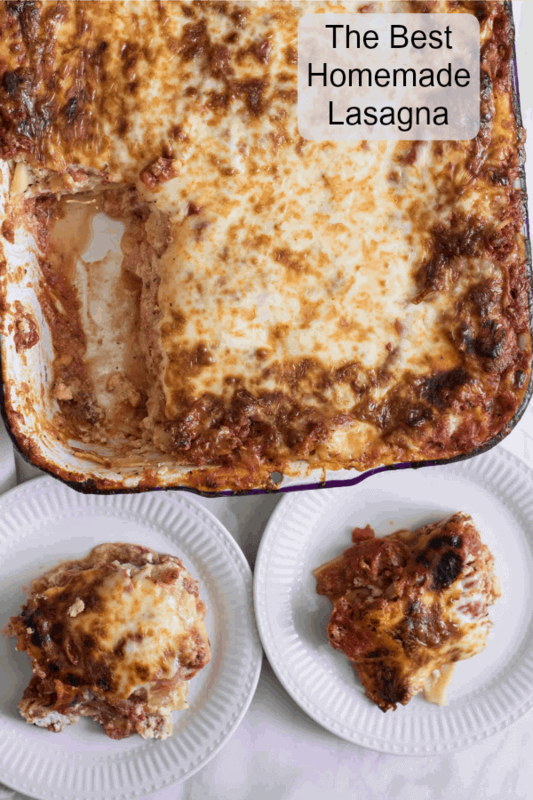 It’s a great recipe to make early in the week and eat the leftovers for lunch or when friends or family are coming to dinner because it feeds a crowd (and just about everyone loves lasagna). 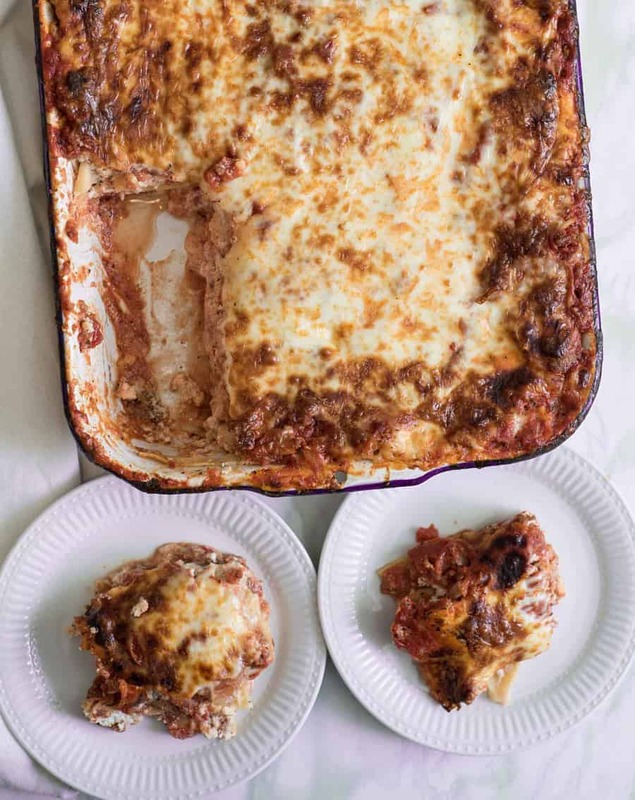 I love this lasagna recipe because it freezes really really well. I never make just one lasagna – I always make two (or three!) and stick the extras in the freezer before baking them. Having homemade freezer meals on hand is a lifesaver and while I rarely do large freezer meal days, making an extra pan or two of lasagna while I’m already making one for dinner is no big deal. I have added instructions on how to freeze this as well as how to cook it after it has been frozen, so if you are interested in that, keep reading! 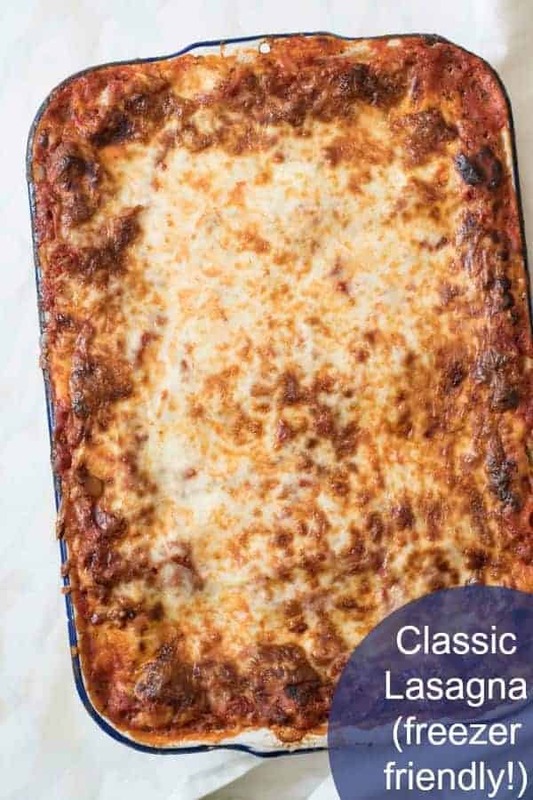 I have tried lots and lots of lasagna recipes, and this is my family’s all time favorite version because it’s just classic lasagna made with a rich meaty sausage and tomato sauce and loaded with layers of cheese. Stick-to-your-ribs hearty pasta and cheese. What more do they need? To bake, unwrap lasagna, cover with greased aluminum foil, and bake on foil-lined sheet in 400-degree oven until hot throughout, about 1 hour; remove foil and continue to bake until cheese is golden, about 10 minutes. 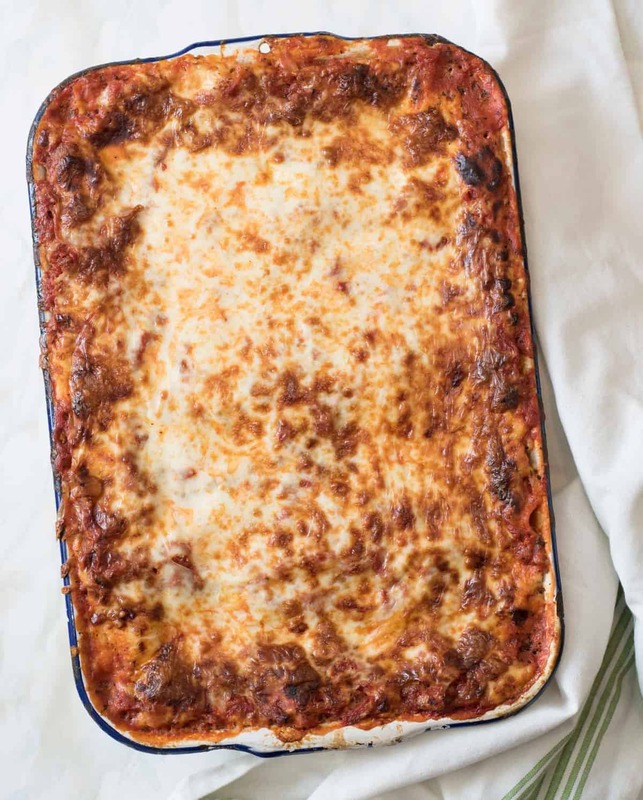 This recipe makes a big lasagna so make sure you have a 9×13-inch or slightly larger pan. I like to keep these foil pans in my pantry if I’m making a lasagna for the freezer. I don’t have to worry about tying up my dishes or getting them back if that lasagna makes it to the home of a friend. This recipe is great for company (it’s that good and you can make it ahead of time)! Serve it with some of my favorite no-knead bread and my favorite fall salad (apples, bacon, candied nuts, and shaved Brussel sprouts…so good) and you are ready for company in no time. This recipe comes from The Complete Make-Ahead Cookbook. I use the cookbook often and it would make a great gift for you or a friend. Definitely check it out! What do I serve with lasagna? Long live comfort food that you can make ahead or stick in your freezer for a meal on a busy evening. I’m so excited to share this great recipe with you and hope you like it as much as we do. Enjoy from my kitchen to yours! Very similar to the one I grew up with and sounds delicious! Do you just multiply the ingredients by how many pans you want to make? Is a “serves 16” a generous helping? Also, I haven’t used the no-boil noodles. Are they really as good as “cooked” noodles? I do just double or triple the ingredients to make additional pans of lasagna. The serving is pretty normal, if you think about a 9×13 pan, you are cutting it in half and then each half into 8 pieces, so not huge, not small, my husband normally eats to servings kind of thing… and yes, no-boil noodles are a game changer! They work great, taste great, and are better than cooked noodles because you don’t have to cook them!